Mitsubishi Ki – 46 – III ‘Dinah’ – pride of the Imperial Japanese Army Air Force, wanted by the Luftwaffe | Shortfinals - aviation and more! Diamond Aircraft Industries, DA-20-C1 – a pretty trainer, indeed! The Vickers Supermarine Walrus – an ugly duckling, but a stout performer! In late 1945, a keen aircraft spotter, located in the ‘back areas’ behind the Allied front lines in South East Asia, would have seen some amazing sights. The distinctive shapes of many well-known Japanese warplanes would be flying about, often escorted by RAF or USAAF fighters. Close inspection would have revealed the mysterious letters ATAIU ahead of an RAF roundel, then SEA after it. This stood for Allied Tactical Air Intelligence Unit – South East Asia; this joint unit of the Royal Air Force and the United States Army Air Forces was founded to repair, fly and test captured Japanese aircraft in order to supply valuable information to the Allied air forces in the area, to give them a tactical ‘edge’ over their opponents. In 1945, one of the unit’s ‘prizes’ was a Mitsubishi Ki-46-III ‘Dinah’, one of the most effective reconnaissance aircraft of WW2. The Ki-46 was so good at its job of long-range, high-speed reconnaissance, that at one stage, the German Luftwaffe wanted to have it manufactured under license for their use! In the late 1930’s the Imperial Japanese Army Air Force used a ‘command’ system of strategic reconnaissance, with Army Headquarters making decisions as to which areas would be investigated. For these tasks, the JAAF was using the Mitsubishi Ki-15, or Army Type 97 Command Reconnaissance Plane Model 1, this was a low-wing monoplane with fixed, spatted undercarriage, a useful range of 1,500 miles and a top speed of 298 mph. Obviously, this was not going to be able to survive against the developed versions of the Spitfire and other potential fighter opponents, so in 1937, the Technical Branch of JAAF HQ, entrusted Major Fujita and Engineers Ando and Tanaka with the the task of establishing a specification for a new high-speed high altitude reconnaissance machine, with the intention of making covert reconnaissance flights over the territories of countries Japan was not yet at war with. It was not unknown for this to happen; for example the Luftwaffe used Dornier 17P and Do215 aircraft to make overflights of Russia prior to the commencement of hostilities, and even Great Britain had employed the Australian pilot and camera expert, Frederick Sidney Cotton, and his Lockheed 12A airliner to take clandestine photographs of military installations during flights over Germany, prior to the outbreak of WW2. On the 12th December, 1937, JAAF HQ issued a specification for a new ‘command reconnaissance aircraft’ to Mitsubishi Heavy Industries Company (the aviation division of the Mitsubishi Zaibatsu, or ‘combine’). Engineer Tomio Kubo, who led the design team, had a major problem on his hands. The JAAF was demanding a high-altitude, long-range aircraft with a speed of 375 mph, or 50 mph faster than the Hurricane I and 60mph faster than the Curtiss P-36 both just coming into service. No restrictions were issued as to weight or other design parameters, other than there must be a crew of two – a pilot and an observer/gunner. The aircraft that emerged was a neat twin-engined, low-wing monoplane of stressed skin construction, powered by two Mitsubishi Ha-26-I 14-cylinder radials of only 875hp, enclosed in special low-drag nacelles, devised by the Aeronautical Research Institute of the University of Tokyo. Unfortunately, with these rather low-powered engines (comparable to the Bristol Mercury used in the RAF’s Bristol Blenheim), the prototype was only capable of 335 mph at 13,125ft, 40 mph below its specified top speed. However, since the Japanese fighters then coming into service – the Mitsubishi A6M2 Type 0 Model 21 and the Nakajima Ki-43 Hayabusa – had top speeds of 331 mph and 308 mph, respectively, the High Command decided to order the new reconnaissance machine anyway, as the ‘Army Type 100 Model I Command Reconnaissance Aircraft’, or Ki-46 – I. A look around the potential enemy interceptors (including the 367 mph Supermarine Spitfire Mk I) convinced the JAAF that they needed more speed from the Ki-46-I, so the early production models were sent to the ‘Shimoshizu Rikugun Hikogakuko’ or Shimoshizu Army Flying School where they were used to train pilots and to participate in an extensive Service evaluation programme. Fortunately, Mitsubishi had a development of the Ha-26 in the works; the two-speed supercharged Ha-102 gave 1,080 hp at take-off and 950 hp at 19,000 ft. When fitted with these engines, in March 1941, the aircraft became the Ki-46-II, and reached 375 mph, making it fit for front-line service. It was ordered into quantity production at Mitsubishi’s Nagoya plant, as the ‘Army Type 100 Model 2 Command Reconnaissance Aircraft’. By July 1941, the 50th, 70th, 74th and 76th ‘Dokuritsu Dai Shijugo Chutais’ (Independent Squadrons) in Manchuria and the 51st D.D.S.C. in China were receiving examples of the new Ki-46-II. Immediately prior to WW2, and on the outbreak of hostilities on the 7th December, 1941, the Ki-46 aircraft made long-range sorties over China, the Philippines, Thailand, Burma, India, Malaya and the Dutch East Indies. The Independent Squadrons followed the lightning advances by Japanese forces, some Ki-46 aircraft (now given the code-name ‘Dinah’ by the Allies) were based as far south as Timor, from where they made sorties as far south as Northern Australia! There were some difficulties on these flights, however, as the ‘Dinah’s’ oxygen system was found to be hardly able to cope with the long missions, also,the undercarriage suffered a number of failures on landing. The ‘Dinah’ had such a great operational record that the Luftwaffe made a request through the Japanese/German Technical Exchange Programme for the rights to manufacture the type under licence. For whatever reason, this deal did not go through. By 1942, it had become obvious to the Japanese High Command that the next generation of Allied fighters, including the F4U Corsair and the Spitfire IX would pose a threat to the Ki-46-II, due to their 400 mile per hour speed and climb performance. Mitsubishi were told to ‘improve the breed’, once again. This time the company undertook a radical redesign, as you can see in the photograph above, taken at the RAF Museum, Cosford. Gone was the ‘traditional’ stepped windshield; instead a smooth, curved, glazed panel extended over the pilot’s seat (the only piece of armour plate in the whole aircraft), and gave the ‘Dinah’ an aerodynamic nose. The faulty undercarriage was strengthened to carry the hefty fuel load (up from 367 to 417 imperial gallons). The whole fuel system was redesigned, with 5 unprotected tanks in each wing (included new leading edge tanks) and two enormous black rubber ‘bag’ tanks, one between the pilot and the observer, and the other directly in front of the pilot’s cockpit. In effect, the pilot was the ‘meat’ in a 92 octane fuel ‘sandwich’! For the very longest missions, a 101 gallon drop tank could also be carried underneath the fuselage. The observer’s 7.7mm machinegun – which had only offered token resistance, anyway – was eliminated to save weight. Finally, the engines were changed for two Mitsubishi Ha-112-II of 1,500 hp, which demanded slightly increased diameter cowlings. The effect of all these changes was to produce an aircraft with an endurance increased by one hour, and a top speed of 404 mph at 19,000ft. After a short test programme, started in December, 1942 and conducted using two prototypes, the variant went into production as the Ki-46-III ‘Army Type 100 Model 3, Command Reconnaissance Aircraft’. 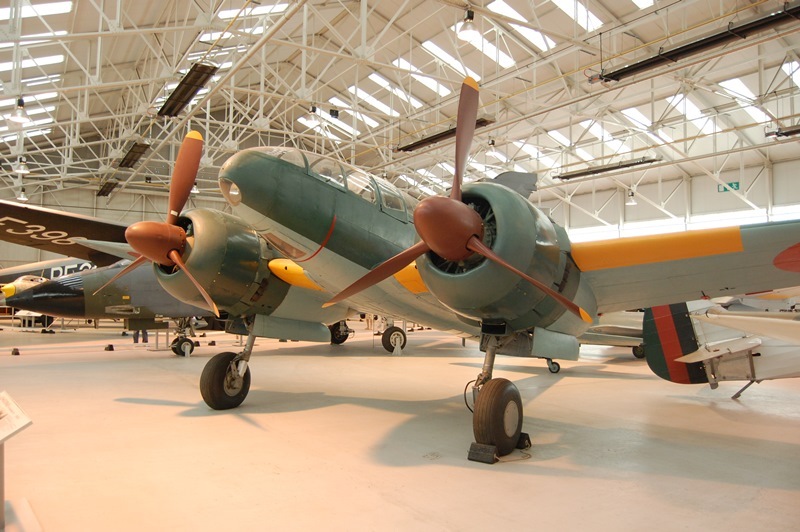 It did NOT initially supplant the Ki-46-II, but was placed in parallel production at Mitsubishi’s plant in Toyama Prefecture. This was due to the damage caused to Nagoya by a massive earthquake, and the severe effects of an attack by B-29 Superfortresses of the 20th Air Force. The production of the Ki-46-II was not finally phased out until late 1944. The Japanese Home Islands were overwhelmed by air power, and the war brought to a sudden end by the dropping of the atomic bombs on Hiroshima and Nagasaki. This left Japanese Forces scattered all over Asia to surrender, piecemeal. In September, 1945, a Kai-46-III (serial # 5439) of the 81st Sentai (Regiment), 3rd Chutai (Company) of the JAAF, which had detachments all over the South West Pacific area, surrendered to British forces at Kahan in Malaya. Quickly acquired by ATAIU-SEA, it was restored to flight status and flown by Japanese personnel to RAF Seletar, Singapore. Some ‘local’ flying was undertaken, until the ‘Dinah’ was one of four Japanese aircraft selected and crated and shipped to the UK for technical evaluation. By 1955, it was recorded as being stored by No. 15 Maintenance Unit, RAF Wroughton (where many years later, I was to work). The aircraft was assigned to the Air Historical Branch, along with other Axis airframes, and was exhibited at RAF Biggin Hill, RAF St Athan and other RAF Battle of Britain Open Days. Finally, in 1989, the ‘Dinah’ was consigned to RAF Cosford for exhibition at the RAF Museum there. A slow process of restoration began, which was aided by a £30,000 grant from Mitsubishi Industries, with the magnificent result you can see here. A Japanese Air Lines Boeing 747 pilot, Captain Takeshi Suzuki, painted the Japanese calligraphy on the aircraft’s tail! The ‘Dinah’ was a most significant reconnaissance platform, being comparable to some of the better Allied machines. It is salutary to note that only 698 P.R. versions of the DH98 Mosquito were built, and around 1,330 (including conversions) of the Lockheed F4/F5 Lightning, but no less that 1,742 of the Ki-46 were constructed – of which this is the sole survivor. The ‘Dinah’ – for all its faults, a highly successful aircraft. The Dinah was powered by reliable engines which was rare when the late-war Ki 46-III saw action. This fighter model therefore had some advantage as an interceptor of Allied raids, since it used the same engines as the Ki 100 fighter but somehow had better speed. The successor of the Ki 46 was the Ki 83 with it’s untouchable climb rate, equal to the F8F! Due to it’s low priority the 438 mph Ki 83 missed WW2 combat, even thoug it flew in 1944! It was faster than the 424 mph F8F too! Something is wrong with the priorities of Japanese fighter production when this world-beater was side-lined behind the 7,000 obsolete A6M5 and 7 model Zeros which did 352 mph at best and! What could a Zero do against B-29s that a Mitsubishi Ki 46 or Ki 83 couldn’t do? What if all those production resources were put into these twin engine dragon slayers instead?